The Corey Crawford concussion on Sunday night is a truly terrible moment in a tough season for the Chicago Blackhawks. Given how the season has gone so far, there's not a lot to get worked up about anymore when the Chicago Blackhawks lose 7-3 like they did on Sunday night against the San Jose Sharks. However, the latest Corey Crawford concussion ensured that this won't be your standard blowout loss. In the midst of a difficult 14-month stretch for the Blackhawks, it's always important to have perspective. Sports are big business, sure, but in the grand scheme it doesn't matter if the Blackhawks beat the Sharks on Sunday or any other team on any other night. We lose sight of that from time to time as diehards, but usually there's something that comes along to bring us back down to earth. It's just unfortunate when it takes something like this. Without wanting to speculate on what another concussion means for Crawford's career long-term, what we know right now is that it's a frightening situation. Crawford missed 10 months while suffering from the effects of a concussion and worked hard to get back onto the ice because his team needed him. The comeback hasn't gone as planned, with the Blackhawks now at 10-19-6 on the season. Their 26 points are the second-fewest in the NFL, with the Kings at 25 points through 34 games. 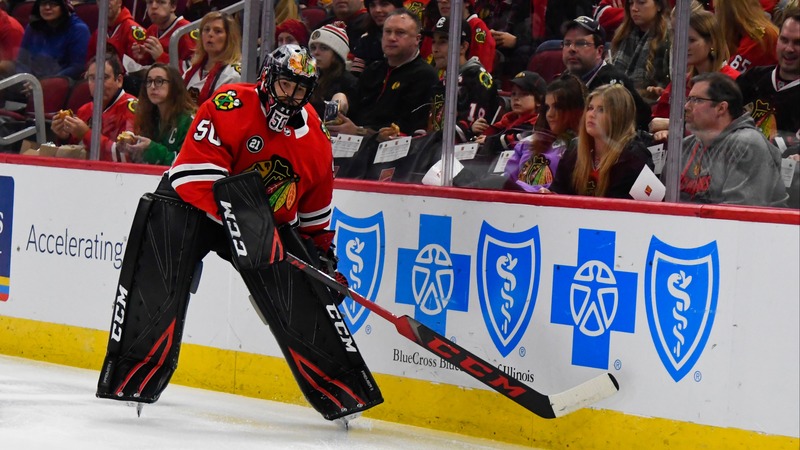 Crawford has had his [ups and downs](https://www.betchicago.com/corey-crawford-carrying-chicago-blackhawks) just like everybody else along the way, but having him out there grinding given everything that he's been through in the last year and change was one of the few bright spots of the season. Which is what makes Sunday such a sad moment for Blackhawks fans. A collision between Evander Kane and Dylan Strome in front of the net caused Crawford to hit the back of his helmet on the post. Kane was called for interference on the play, but it [wasn't viewed](https://chicago.suntimes.com/sports/blackhawks-corey-crawford-head-injury-concussion/) as a dirty hit by Strome. Hockey is a physical game and injuries like this are commonplace. You just wish it didn't have to happen to someone who has a history with concussions like Crawford. At the same time, one of the risks assumed when he returned was that he was always going to be more susceptible to suffering another injury. Which isn't to say that he shouldn't have been on the ice or that he made a mistake. It's just the situation he was presented with. Moving forward, it's impossible to think about recovery time at this point. However, there's no avoiding the reality that a certain number of concussions force long-term consideration. Crawford is a 33-year-old with a one-year-old son. Hockey won't be his only concern and, frankly, it shouldn't be ours either. So we can save all the talk about what this means for the Blackhawks and who they should turn to next for another time. Especially when everybody is worried about whether or not they are ever going to see their one of their all-time favorite Blackhawks play again. We'll know more about Crawford's status in the coming days and weeks. Of course, we'll all be hoping for the best during that time. All year long, Blackhawks fans have been comparing their ordeal to a nightmare. On Sunday, we all got an unfortunate reminder of how much worse things can get.